Rich in ideas, high in drama, refined in aesthetics and impeccable in production values, this film is a must-watch. Biopics are of two kinds - one that tries to concoct history; and the other that tries to live up to history. While the former is an image building exercise, the latter tries to document events of a personality whose tale deserves to be told. The eponymous biopic of Dr. Babasaheb Ambedkar falls in the latter category. While the contemporary narrative reduces Dr. Ambedkar to the role of Chairman of the Drafting Committee of Constituent Assembly, the biopic gives him the due status of a social iconoclast. The biopic directed by Jabbar Patel tries to capture within its 180 minute running time the different layers of his multi-faceted personality such as being a scholar, progressive thinker, firm believer of human equality and justice, fierce opponent of orthodoxy and fearless crusader of social justice. The national award winning film begins by showing the student days of Ambedkar at Columbia University, where he studies on a scholarship from the King of Baroda. Ambedkar, whose prodigious intelligence was noticed by the King, was chosen as a social experiment to bring gradual social reform in the society. In Columbia, we see Ambedkar (played by veteran Malayalam actor Mammootty) deeply engrossed in his studies, keeping aloof from the developments in freedom struggle movement back home, much to the surprise of many. He is shown to be skeptical about the improvement of the state of low castes even if British rule is replaced by upper caste Hindus. His doctoral thesis on casteism introduced to Western academia the horrors of this unique Indian phenomenon of graded social hierarchy which treats millions of 'untouchables' worse than animals. His return to India after studies threw him into a cauldron of caste hostilities. He realized that erudition and brilliance will not efface the "untouchable" stigma. He found it difficult to find a place to stay in Mumbai; his colleagues took objection to him sharing their jug of water; his students at Law College refused to accept him. This cruel social ostracism is poignantly portrayed in the film. The Mahad Satyagraha (1927) is powerfully depicted in the movie, doing complete justice to the significance of this historic event. The Bombay Legislative Council Council had passed a law permitting low caste persons to use public tanks. However, fearing backlash from the upper caste, the low caste persons did not exercise their legal right. Ambedkar organized a mass movement to break the caste barriers, and hundreds of persons under his leadership openly drank water from the tanks, causing resentment to the upper caste members of the region. They carried out a purification ceremony of the tanks, to remove the effect of "defilement". Also, the low caste persons who dared to use the tanks were violently attacked. These incidents shown in the movie remind one of the violent events which occurred in Kerala after the entry of women in the Sabarimala temple in exercise of their right declared by the Supreme Court. More the things change, more they remain the same!. Ambedkar's movement gradually picked up momentum. The next step was Kalaram temple entry struggle. In between, he carried out the radical act of public burning of Manusmriti, the ancient text which gave legitimacy to the iniquitous varna system. The temple entry struggle was primarily a movement to assert right to equality, than the right to worship. Later in the movie, we see Ambedkar telling his wife Ramabai that the low castes should boycott the gods who do not wish to bless them. "A god who discriminates is not a god but a piece of stone", he tells her, when she expresses desire to visit Pandharpur temple. Gandhi and Ambedkar had contrasting personalities. Ambedkar's world view rooted in individualism, rationality and modernity was mostly irreconcilable with the traditionalist and collectivist approach of Gandhi, who often invoked inscrutable spiritual mysticism to sanctify the status quo. In an interesting essay titled "The Doctor and the Saint", Arundhati Roy likens Ambedkar to a doctor, who uses rationality and scientific temper to cure social maladies, and Gandhi to a "saint", who hopes to transform social inequities through well-intentioned but ineffective homilies. "While the Doctor was looking for a lasting cure, the Saint journeyed across India distributing a placebo", Roy comments. The drama in the equation between Gandhi and Ambedkar is a highlight of the movie. 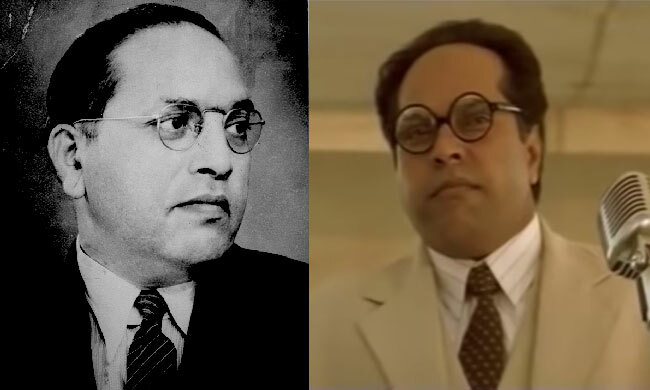 Incidentally, Ambedkar is conspicuous by his absence in the 'Gandhi' biopic directed by Richard Attenborough. The film has no hesitation in showing that Ambedkar was not swayed by the demigod status of Gandhi, "He is a seasoned politician", Ambedkar is seen telling one of his friends. "History tells that Mahatma's are like fleeting phantoms who raise dust, but not levels. They try to perpetuate blind faith in place of intelligence and reason", he adds. The first official meeting between the two is an iconic scene to watch out for. Ambedkar openly expresses his distrust of the commitment of Congress to the cause of "depressed classes". He tells that Congress will change nothing about the existing caste discrimination, and that "freedom" from British will mean nothing for the 'depressed classes'. In one sentence, Ambedkar expresses his deep pain at the continuous feeling of alienation experienced by him : "Gandhiji, I have no homeland". This startles Gandhi, who until then was under the impression that Ambedkar was a progressive Brahmin from Pune. Later, Gandhi realises that Ambedkar belonged to "Mahar" community. Their differences get more pronounced in the Second Round Table Conference. Ambedkar insisted for a separate electorate for depressed classes. Gandhi opposed it saying that it will destroy Hindu religion. While Gandhi said that he was against the practise of "untouchability", he was reluctant to denounce "varnashram", which according to him was an "integral part of Hinduism". Ambedkar termed this a contradictory stand and opposed the simplification of caste issue as that of "untouchability" alone. He said that Gandhi's moral appeal and spiritual exercises will not change social mindset of a society. "Our salvation lies in political power and not in pilgrimages or observance of fasts", Ambedkar stated. Ambedkar argued that if Sikhs and Muslims can be given separate electorates, why should it be denied to the depressed classes, whose situation was far worse than that of religious minorities? His emphatic arguments had effect on the British, who announced a 'communal award', accepting the demand of separate electorates for depressed classes. Fearing that this will lead to the division of Hindu fold, Gandhi announced an indefinite fast to signal his protest. Public opinion turned against Ambedkar, who was perceived as a villain. "Cursed as an enemy of nation and a destroyer of Hinduism, I am the most hated man in Hindu India", said Ambedkar. But he added "If an objective review of my life is taken by the future generation after the dust has settled, perhaps they will reclaim my relevance to the lives of depressed classes". Gandhi's fast, which is made to appear as a political blackmailing tactic, forced Ambedkar to give up the claim of separate electorates, leading to the historic Poona pact. The film is deeply political, as its focus is more on the ideas of Ambedkar than his personal life. A major share of screen time is dedicated to his lectures ,speeches and narrations from his writings, which convey his concepts of liberty, power, equality and justice. The rich baritone of Mammootty is a suitable medium for the powerful ideas. "Educate, organize and agitate" - these words of Dr.Ambedkar in the rich baritone of Mammootty sound more powerful than all the 'punchlines' delivered by the actor in his 'superstar' movies. The detailed depiction of Dr. Ambedkar's lectures and presentations in University, his speeches at public gatherings, and his submissions at the Round Table Conferences and Constituent Assembly are educative and inspirational. It is evident that the film, which took nine years in making, is a product of meticulous research. At the same time, the film takes care to ensure that Ambedkar is not painted as a unidimensional intellectual. It invests much pathos to offer glimpses of his worries and insecurities, which make him appear more human and relatable. He is shown as a vulnerable human who derives strength from his misery. The movie ends with Ambedkar publicly embracing Buddhism and renouncing Hinduism, for liberation from the "cesspool of caste inequalities". This followed the unceremonious exit he had to make from the Nehru cabinet, which had buckled under pressure from orthodoxy to dilute the Hindu Code Bill drafted by him. Dr. Ambedkar's belief in individual autonomy and irreverence to dogmas perhaps influenced his choice of religion too. "Buddha's teachings are modern, rational and ever contemporary. There is no dogma. He makes you think and live by reason. Except Buddha all founders of religion claimed for themselves the role of saviour. Buddha was satisfied with simply being a guide", he is shown as explaining his reason for choosing Buddhism. Dr. Ambedkar ensured that the Constitution is not a mere document of transfer of power; but a transformative text which infuses the values of democracy, progressiveness, liberty and equality into the Indian psyche. "Constitutional morality is not a natural sentiment. It has to be cultivated. .Democracy in India is only a top-dressing on an Indian soil, which is essentially undemocratic", he commented, deeply conscious of the ground realities. The film does justice to the greatness of Ambedkar's personality, without ending up as a hollow hagiography. Rich in ideas, high in drama, refined in aesthetics and impeccable in production values, this film is a must-watch. Mammootty's stellar performance as Dr. Ambedkar earned him the National Award for best actor in 1999. No release of the film. In this context, it is to be mentioned that the film has not been released for public viewing even after 19 years. It was during the birth centenary year of Babasaheb Ambedkar the Union Ministry of Social Justice and Empowerment under the V. P. Singh Government and the Maharashtra Government jointly produced the film which talks about the life and contributions of Ambedkar. The film production was managed by National Film Development Corporation. Despite being a government production, which has been dubbed into several regional languages, it is unfortunate that the film has not been released for public viewing. It may also be noted that the none of the national channels, including the public broadcaster Doordarshan, have shown this movie even once for fifteen years since production. It got its television broadcast for the first time in 2016, when it was reportedly shown by Doordarshan.